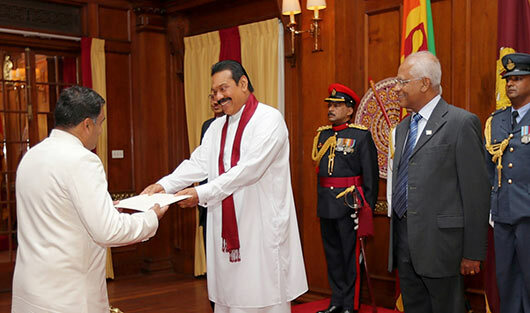 New High Commissioners from Canada and India taking assignments in Sri Lanka presented their credentials to President Mahinda Rajapaksa at 10.45am on 03 July (Wednesday) at a ceremony held at the Presidential Secretariat in Colombo. 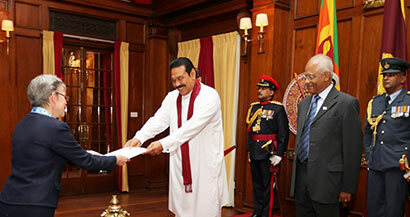 The first to present credentials to President Rajapaksa was the new Canadian High Commissioner to Sri Lanka Ms Shelley Whiting. She was followed by the new High Commissioner of India to Sri Lanka Yashvardhan Kumar Sinha. The new diplomats thereafter joined in a discussion held under the patronage of President Rajapaksa. The credential presentation ceremony was attended by the Minister of External Affairs, Prof G.L.Peiris, Secretary to the President Lalith Weeratunga, Secretary of the Ministry of External Affairs Karunathilaka Amunugama and senior officers representing Sri Lanka Security Forces. Chief of Protocol of the Ministry, senior officials of the Ministry of External Affairs and officials of the respective High Commissions were also present at the occasion. New Indian High Commissioner Y.K. Sinha is a seasoned career diplomat and during his service of 32 years, has handled several important assignments in Indian diplomatic missions and at the Ministry of External Affairs, New Delhi. Before coming to Sri Lanka, he was Additional Secretary (Pakistan-Afghanistan-Iran) at the Ministry of External Affairs, New Delhi. He has also served as Ambassador of India to Venezuela, Consul General of India in Dubai and held key positions in Indian Missions in New York, Islamabad, Rome, Abu Dhabi and Riyadh. Mr. Sinha is married to Girija and they have two sons. New Canadian High Commissioner Ms S. Whiting is also an excellent career diplomat appointed for Sri Lanka with concurrent accreditation in the Republic of Maldives. She joined External Affairs and International Trade Canada in 1989 and was assigned to Canada’s Permanent Mission to the United Nations in New York. Other foreign assignments include Belgrade and Bangkok (as Second Secretary and Vice-Consul). Ms. Whiting also served as Ambassador to Bosnia-Herzegovina from 2003 to 2006. In Ottawa, Ms. Whiting has worked in various divisions at Foreign Affairs and International Trade Canada, including International Economic Relations and Summits, Regional Security and Peacekeeping, and Oceans, Environmental and Economic Law. Ms. Whiting also served as deputy director for human rights and humanitarian law, Canadian political adviser to NORAD, director of defence and security relations and as the deputy representative of Canada at Kandahar Air Field. Most recently, since 2011, she served as deputy head of mission in Kabul. Ms Whiting began her career in the legal field, working with a Vancouver law firm after obtaining her BSc at University of Alberta (1981) and LLB at University of British Columbia (1987).